Colony Espresso & Beer (which has recently become a new favorite hangout of mine) launched a Kickstarter today to bring a 4th brewery operation to NKC in Spring 2017. So enlighten me, is this place open already and this is an additional location? Owned by good people, good friends of mine from way way before this even became a possibility. Hope it flourishes, hope all of NKC flourishes. I'm still pretty shocked NKC is not among the hottest real estate in the city. It's like the best parts of Waldo with better schools, better location, and a better downtown. chingon wrote: I'm still pretty shocked NKC is not among the hottest real estate in the city. It's like the best parts of Waldo with better schools, better location, and a better downtown. You generally don't find people moving out of homes that can cost the same per month as an apartment. Most of town isn't hot because only an idiot would move out if they don't have a good reason like a new job too far away or can afford better. They're just not coming up for sale. Ground is finally being broken for new construction at I-35 & Armour Road. Meirotto's jewelry will be building at the southeast corner with a slated opening in Fall 2017. After the Superfund cleanup project is done where Sutherland's used to be, Burger King will be moving to the east and the infrastructure for all that empty land will start going in. Nice to finally see some progress in that area. For anyone that hasn't seen it, the NKC site is larger than the riverfront development space. I hope they connect it into 16th Ave.
My understanding is that it will connect to 16th Avenue. A full interchange at 16th / I-35 would really help make it accessible. Nice to finally see ground being broken for new development along Armour Road, east of I-35. Long time coming. Jeweler HQ is what we need. http://members.blockrealestateservices. ... _Email.pdf Freddy's on the property Main Event is going on. Mad Greens coming. Larkburger more then one location. Menards Shawnee 2017. More then 2 locations for Kneaders Bakery and Cafe. 2 new Pets stores coming. The Menards on MO-152 near Green Hills opened today. 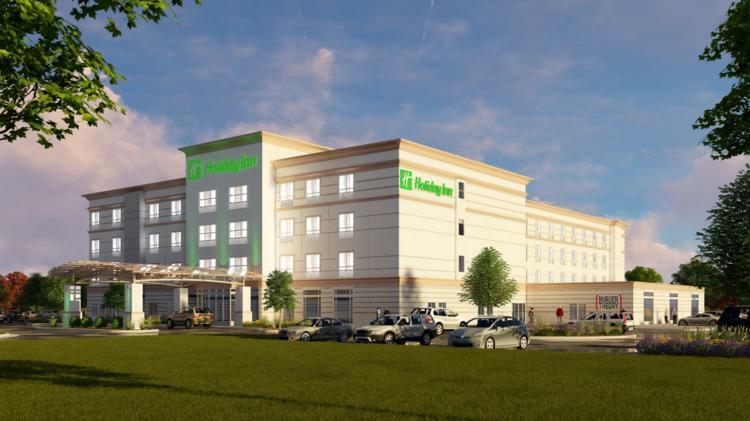 Two new hotels coming to the Hunt Midwest Commerce Center at I-435 and Parvin Road. Holiday Inn will replace its' current hotel building with a new structure a block south of the current one. The new hotel will have 126 rooms. A 90-room SpringHill Suites by Marriott will also be constructed at NE 44th St. and N. Corrington Avenue. Both hotels will open in 2018.
https://data.kcmo.org/Development-Revie ... /ytzy-pkcf A new Restaruant but not who and so on. mgsports wrote: https://data.kcmo.org/Development-Revie ... /ytzy-pkcf A new Restaruant but not who and so on. A fill in the blank game. No theirs one up for approval but name not shown in that Agenda and no Packet for it. There was a rumor floating around Nextdoor that Q39 is going in behind AMC Barrywoods.